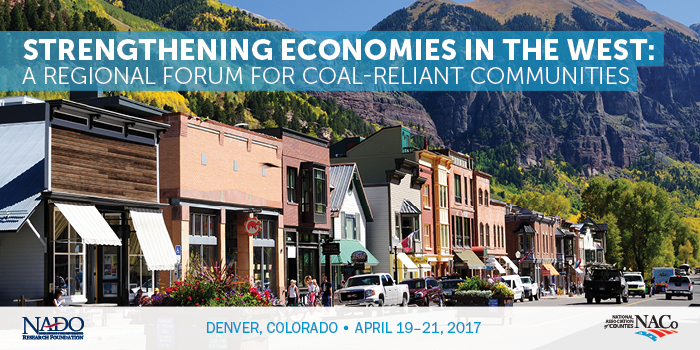 Join the National Association of Counties and the National Association of Development Organizations(NADO) Research Foundation in Denver, Colorado on April 19 – 21 for Strengthening Economies in the West, a free forum designed for coal-reliant counties and regions in Colorado, Montana, Utah and Wyoming. This convening will bring together stakeholders from a variety of public and private sectors for an educational and interactive gathering to share best practices, lessons learned and new opportunities to support economic diversification. Prepare for a mix of plenary sessions and smaller group discussions covering a variety of topics including infrastructure, manufacturing, entrepreneurship, local foods and arts and tourism. This forum is funded through the support of the U.S. Economic Development Administration - Denver Regional Office. The draft agenda is attached and will be updated in the coming weeks. Please direct any questions to Sanah Baig, NACo Program Director at SBaig@naco.org or Brett Schwartz, NADO Program Manager, at bschwartz@nado.org. NOTE: We have secured a group rate for this event at The Curtis Hotel. These rates will be available until Friday April 7th. Reservations can be made by calling Reservation Coordinator Lindsay Dvorak at 720-889-4782.